WIP Wednesday is here again! Seems like it was just Saturday. I seem to have endless WIP projects :o) This week Susan and I have been attacking our green scraps for the #bescrappy fun on Instagram. Have you been playing along? You can see more of my scrappy color block block by visiting my gogokim Instagram. I decided to crack open my Farmer's Wife Sampler book that has been on my sewing table for months ( it is embarrassing how long) and I made block 14 for fun. In this block are a variety of greens and the background fabric is Zen Chic Modern Backgrounds for Moda Fabrics. With such small pieces, I always use Aurifil 50wt. The two ply 50wt ensures that your 1/4 seam IS a 1/4 inch! Not all threads are created equal is 50wt is the weight of the raw material not of the standardized measurement of the final product. 50wt threads by different manufactures can be different in their thickness. There is also two ply vs 3ply. With Aurifil there you will have perfect seams and flatter seams every block! I have also been working on my Little Dresses For Africa! It is a wonderful organization. You can also make Britches for Boys and monthly pads for girls so they can go to school. Find out more about how you can help out using their free patterns by visiting their website. I made this sweet Betty Ann pattern by Sis Boom! You can find more of Jennfer's patterns by visiting here. The pattern is a pdf. I found the size I needed and printed up only those pages. I used the directions from the pdf on my laptop to follow her very clear instructions :o) Good pattern! YAY!!! It has a gathered from and simple elastic along the back for a good fit. I used these beautiful Denyse Schmidt fabrics I had in my stash and Aurifil 40wt for construction. I have so many more projects and I will have a BRAND NEW pattern to release with the next couple of days! I am so super excited! 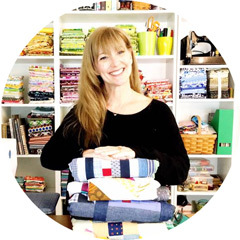 If you are using up your scraps be sure to add the #bescrappy and tag Susan and me so we can see your amazing projects!